The modern short story is a fusion of sketch and tale, a distinct and autonomous, though still developing, genre. If Edgar Allan Poe, one of its first exponents, stressed on the “compact, unified effect” of the short story, Bijoya Sawian extends this norm to include a spirited twist at the end, rather like Jeffrey Archer’s compositions. 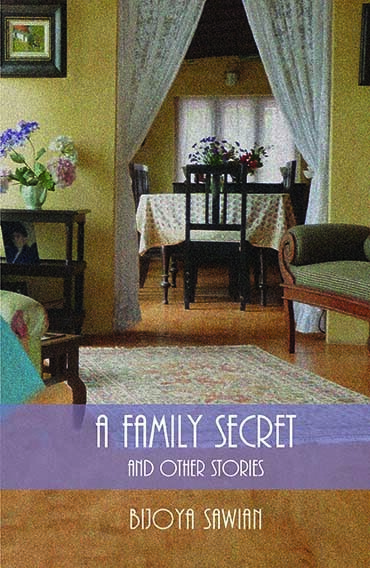 What makes A Family Secret and Other Stories a charming collection is the all-pervading portrayal of Meghalaya, especially Shillong. The liberal use of Khasi words is an added joy for those familiar with the language, yet not too difficult for other readers to fathom. Khasi customs, traditions and matrilineal traditions comprise the bulwark of the narrative structure. While most short stories in the 20th century are dominated by a sensitivity to — and experimentation with — form, Sawian has chosen to give primacy to characterisation and plot. The descriptions to flesh out the characters are lively. Take, for instance, “Riiaka, eyes half shut, clutched her sheaf of papers and her handbag tightly and braved the wind with determined steps as her jainsem flapped on her lithe body, like a bird in panic.” It takes very little effort to visualise this, especially one familiar with Shillong in March! The characterisation is women-oriented: as daughter, mother, sweetheart or sister. Unlike her previous novel, Shadow Men, where the protagonists are male, this volume focuses on relationships viewed through the female prism. Thus we have lovely names likes Saphira, Riiaka, Asorphi, Linsinora and Dalinia, among others, who populate the pages with their grace and beauty, insight and wisdom, recklessness and heartbreak. The author tries to portray that in spite of being romantic, feminine and sometimes rebellious, the women are very family-oriented. Sawian’s gentle cadence appears to come from an intrinsic Khasi upbringing, her familiarity with Shillong, Sohra, Delhi and Dehra Dun complimented by a love for Kahlil Gibran and Richard Bach. Hers is a language easy to relate to; fluid and simple, with no unnecessary stylistic embellishments to detract from the linear tale. Love, loss and longing are the predominant emotions in these tales. With a touch of Blakesian magic, Sawian’s songs of innocence and experience are lyrical and pantheistic. The enduring aspect, perhaps, is that the stories, like vintage wine, have a mature blend of wit and irony, sense and sensibility and the ability to stay with the reader long after the covers are closed. SHE wears a jainsem. She prays, she sings, she dances. She lives in the matrilineal home, even after marriage, and is a support to her parents. She shelters other less fortunate members of her family. If she falls in love with a handsome stranger, she is brave enough to follow her heart. A wedding is a joyous and important occasion in these hills but if she conceives out of wedlock, her child is not ostracised, but is welcomed into this world and nurtured by society. She bears the betrayals of life with dignity and stoic wisdom. And, in one instance, she is even a ghost! To one unfamiliar with Meghalaya, as I am, reading Bijoya Sawian’s second book ‘A Family Secret and Other Stories’ (Zubaan 2014), is like stepping into a whole new world. As the stories unravel – with gentle grace and lively twists – the reader is led by the hand and introduced with charming felicity to the customs and traditions that comprise the Khasi way of life. The stories are written in a deceptively simple style, but with a profound undercurrent that dwells on the complexities of human relationships. Tradition and family values play a pivotal role in the unfolding of these tales. The inevitable and startling twist at the end of each story is like a dash of Tabasco in a seemingly mild concoction. In this book, life is viewed through the prism of a woman’s perspective. Different facets of a woman’s personality are explored through the lives of these characters. So we have the young Saphira, whose childish curiosity leads her to a disturbing family secret. Riiaka, on the brink of youth, allows herself the luxury of falling in love with a total stranger. Asorphi and San Phyllis share in their relationship the bond of maternal love. Betimai shows great depth and largeness of heart by acknowledging the love-child of the husband she dearly loved. And Dalinia, the quintessential dreamer finds herself in the bewildering land of love, loss and longing. These women are true to their feminine nature, embodying in their dealings with the world tenderness, wisdom and compassion. The men are pillars of strength and are always there to lend support whenever the need arises. The modern day traits of drive, ambition and the desire to forge ahead at any cost are absent in these stories, which gives a most refreshing old world feel to the book. Vivid descriptions of nature add an extra dimension to this collection of short stories, bringing to life scenes from the hills of Shillong and Mussoorie. The pages are liberally dotted with the scent of pines, the romance of mountain mists, the songs of vanishing brooks and flower beds that are ‘ bursting with colour’. The quaint settings and Khasi terms lend an unusual charm to the stories. The leftover traditions of the Raj, such as the ceremony of afternoon tea, are lovingly described. The china cups are patterned with ‘ pink blossoms’; the cucumber slices are wafer thin wedged in slices of bread; the cake is walnut; and served by a ‘liveried bearer’, out on the lawns. All of it serves to embroider the reader’s imagination with little vignettes of Shillong life. Sawian’s book is a deft portrayal of life in its inexorable flow from birth to death; confusion and clarity; love and betrayal; hope and despair. It is the perfect book to curl up with on a rainy day, wherever you may be.